We've seen some pretty cool space-related Apple ARKit demos in the past few weeks. One guy literally had the entire solar system rotating around the sun in his bedroom. Now, a recent demo shows that you can get up close and personal with our Earth, watching how it changes as it rotates. Obviously, this projected image is moving a bit faster than our actual world, but you can get the gist. 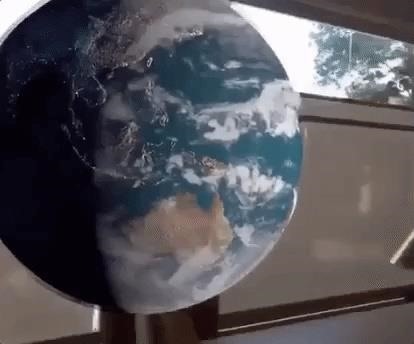 The demo was posted by Twitter user Josh Singer who created the globe in his office. It's animated to rotate with one-half of the world lightened, and the other half in darkness. You can even see the lights of cities turn on and off as parts of the Earth shift from night to day. There are clouds surrounding the exterior of the image as well, showing off a model of our atmosphere and how weather travels. Singer's demo is a pretty cool way to get a close, 3D look at our planet. I can definitely see this, along with the solar system demo and others, being a fantastic education tool in the future. Check out the full video on Josh Singer's twitter here!